Piezodorus guildinii (Red-banded Stink Bug). My wife discovered this one on my T-shirt (after an unsuccessful trip to our porch lights) and skillfully transferred it to a kitchen towel. 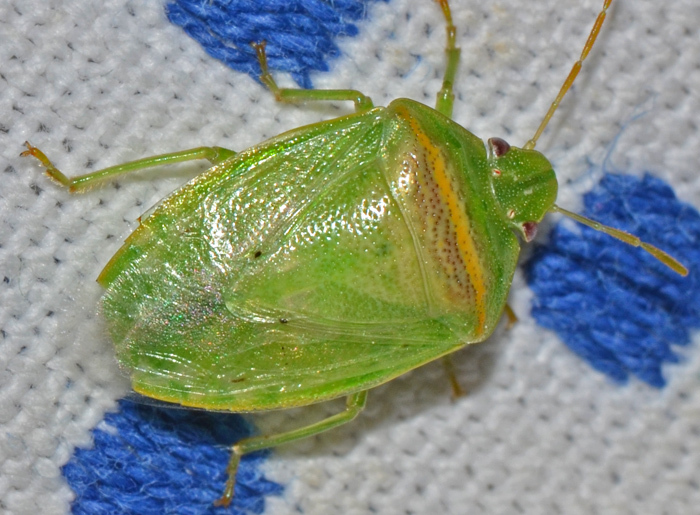 The Red-banded Stink Bug is native to South and Central America, and the southern US. It is apparently quite common in Florida and sometimes considered a pest as it feeds on seeds of legumes such as soybeans and alfalfa. Five to eight generations can occur in a single growing season.